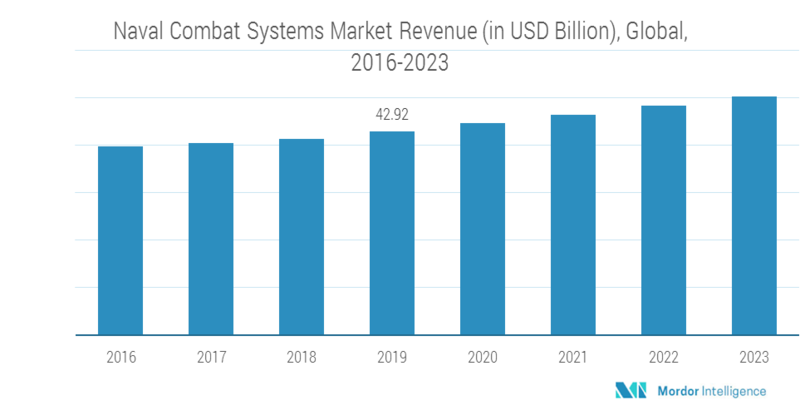 The naval combat systems market is expected to record a CAGR of 4.03%, during the forecast period. The Naval Systems in recent times have become increasingly relevant and popular and nations are ramping up their naval capabilities. The emergence of new technologies such as the advanced airborne radars, which are capable of automatically detecting vessels over a long distance is driving the market. North American region, which is the manufacturing hub and the largest market for naval combat systems equipment, expected to show a steady growth rate in the forecast period. The demand in the United States will be mostly replacement demand, as the equipment becomes obsolete. The growth rate in the North American region is anticipated to see from Mexico, as it will actively seek to acquire such systems going into the future. Mexico global influence is increasing, and it is coming out of the shadow of United States. Mexico expecting to expand its impact both in the Pacific and the Indian Ocean, for which it is anticipated to make considerable investments in the Naval Combat Systems. The Asia Pacific region is expected to foresee significant growth during the forecast period, due to various conflicts and tensions in the regions. One of the major drivers for this market is the currently ongoing submarine upgrade programs. Submarines are an integral part of a nation's naval fleet, and hence, it is essential to keep them upgraded and maintained. Many upgrading programs are going on across the world for improving the submarines. The Pipavav Defence and Offshore Engineering signed an agreement with Russia-based JSC Ship Repairing Centre Zvyozdochka for medium refits, upgrade and life certification of eight EKM 877 submarines in India. This also marked the first time the work for the refit of submarines was being considered for the private sector in India. A refit in India has several advantages, the most essential being savings on transportation costs to Russia and back, and the enhanced operational availability of the submarines for thousands of additional hours by avoiding the downtime in transporting them to Russian and back. The growing demand for advanced integrated combat system is one of the opportunities for the future. The success of advanced integrated combat systems and advanced integrated soldier systems for ground troops, the system is becoming popular for the use in naval forces as well. AICS is a modular, integrated, and upgradeable fighting system, which equips the ground forces dismounted and mounted soldiers with a variety of technologically advanced features, interconnected into a single platform. The system meshes each section of soldiers into the digitised battlefield as a weapons system in their right, each man-platform in this segment contributing to the more significant Network Enabled Capability. Major Players – BAE Systems, Lockheed Martin, Thales, Raytheon, and ATLAS amongst others.